Trail running and riding can be the best running and riding out there but be careful not to let dangerous vegetation get you. A few years ago on my 50th birthday, being new to Canada and totally naïve, I had the lovely experience of brushing up against some poison ivy. At first, my wife and I thought the first lesion was psoriasis and since my father has it, I thought “oh well, happy birthday to me”. My usual easy going attitude didn’t help since I didn’t seek any medical attention. Two weeks later, my whole skin erupted and I looked like a Dalmation with red spots – no lie! 85% of the population is allergic to poison ivy and if it brushes against your skin, you will develop a contact dermatitis. 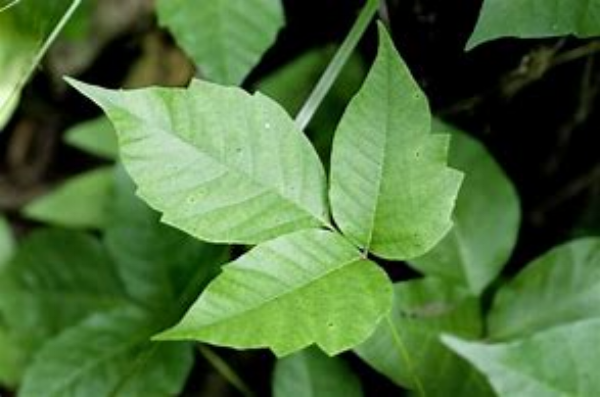 If you are allergic to poison ivy, you will probably be allergic to poison oak and sumac too as they all contain the same rash inducing plant oil called ururshiol. How do I know if I have a poison Ivy, Oak, and Sumac Rash? Poison ivy, oak, and sumac are generally diagnosed by their common symptoms of a rash, blisters, and itching following activity outside in a forest or field, but if you have any doubt, ask your doctor. How should I treat a rash? Wash the area well with mild soap and lukewarm water asap. Wash all clothes, shoes, socks, pets and other items that may have become contaminated. Try calamine lotion for the itching. Do not use skin products that contain anesthetics or antihistamines, which can cause their own allergic reaction. To help relieve the itch, try cool showers or a mixture of baking soda and water applied to the area. If sleep is a problem because of the itching, try an over-the-counter oral antihistamine at night. Can I Prevent Rashes From Poison Ivy, Oak, and Sumac? "Leaflets three, let them be." Poison ivy and poison oak have a triple-leaf structure you can learn to recognize -- and then avoid. Avoid any contact with these plants when possible. Cover your skin completely when running or riding in forests and around shrubs; wear long sleeves, long pants, gloves, socks, and boots. Remember that you can also get a rash from indirect contact from clothes or pets that have urushiol on them. Stay tuned next week for dangerous insects.